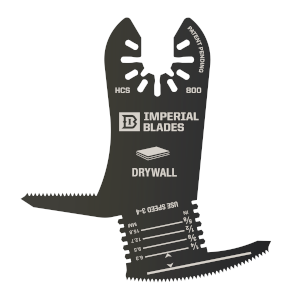 Imperial Blades' Award winning One Fit 4-in-1 Features Drywall Blade was designed for easier cuts in drywall for electrical outlet boxes, can lights, PVC and more! As an added bonus, the front width of the blade is specifically calculated to plunge cut the width of a standard American outlet box. Our One Fit anchor is compatible with Milwaukee, Ridgid, Ryobi, Bosch, Craftsman, DeWalt, Dremel, Fein, Makita, Genesis, Porter Cable, Performax, Rockwell, Stanley Black & Decker, and more!